Here at 3plains, not only do we offer the means of creating a beautiful website for your business, but we also offer the services that help potential customers find your website. The most beautiful website in the world will still go unseen without a good search engine optimization strategy. Everyday search engines and online marketing outperform traditional advertising in terms of Return on Investment (ROI). Perhaps you, like most people, are fairly new to Search Engine Optimization (SEO)—and aren’t sure what to do about it. I find having educated customers and clients are far more beneficial than confused and misled clients, so let us help bridge the knowledge gap. Conceptually, think of search like a giant online phone book. Let’s say you are in the Dallas area and are looking for restaurants to eat at. Ten years ago, most people would have whipped out a Dallas phone book at their home and started looking in the restaurant section. These days, people spend 1/10 the time using search engines—simply by typing “Dallas Restaurants” or “Dallas Plumbers” or “Car Dealers in Dallas” into Google. Google almost always pulls relevant results for just about any search term. Everybody who is online is in Google's phone book, and everybody who does SEO is on the front page of it! People always look at the top results in Google. Here is an eye-tracking heat chart of where users spend the most time looking. Searchers who type “Dallas Restaurants” are bombarded with hundreds of results, just like a phone book. The results in Google are ordered 1-10 on the first page and 11-20 on the second page and so on. The key difference between a phone book and Google is that Google lists search results in order of relevance a.k.a. your rank (more about this later). The restaurant who ranks #1 for the search query “Dallas Restaurants” is getting hundreds of visitors a day while the restaurant who ranks #95 is getting very few (for that search query). It should be no surprise that the entity ranking #1 for “Dallas Restaurants” is making a killing off of search traffic. Ranking well for that term has brought thousands of free visits from people looking to eat in the area. People click the #1-#5 results with regularity and ranking high for those terms essentially becomes free advertising to highly interested consumers. 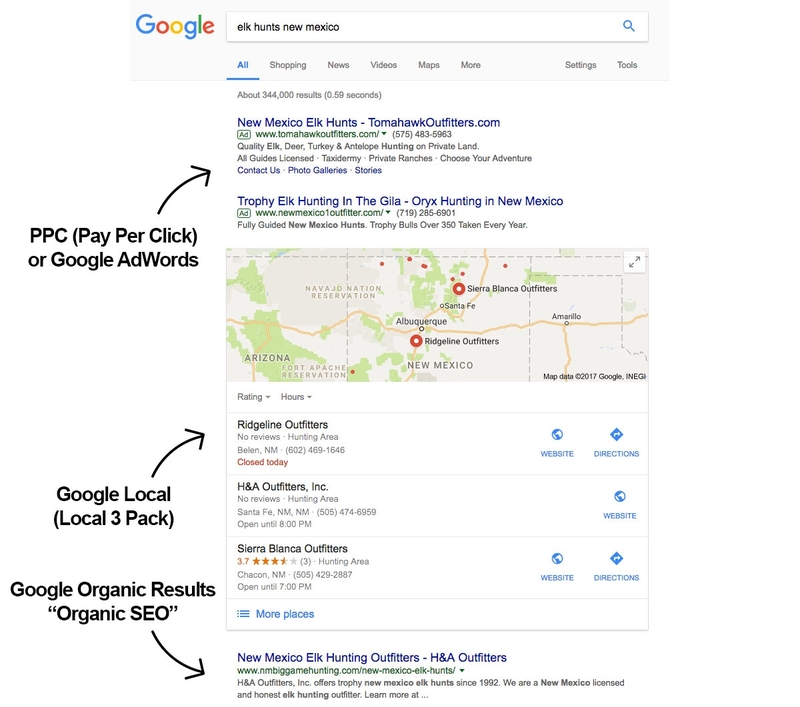 What makes Google so great for advertising is that it displays relevant websites to users who have already typed in a key phrase (searchers already expressed interest in Dallas restaurants via their search term). Radio stations, billboards, newspaper ads, and other traditional advertising methods preach to everyone—very few of which are interested in Dallas restaurants. Thus, the ROI for search engine marketing is much higher because it only is highlighted when someone has typed in a relevant key phrase, making your chance for conversion leaps and bounds above traditional advertising. Naturally, everybody wants their website to rank high in Google searches because that means more business and more money. The next logical question becomes how do I rank high for my particular business ‘keywords’? This is the million dollar question and what introduces the idea of SEO. SEO is all about creating, editing, tweaking and analyzing websites and search queries in order to drive relevant traffic to a business page. After all, whoever is searching for “Dallas Restaurants” is looking to spend money—so businesses fight to be the top rank or first page for these terms. Search engines like Google determine their ‘relevance’ and rank by a very complex algorithm that studies each and every page on the internet and decides what page is probably the most useful to the user. Though Google keeps this ranking algorithm a secret, SEOs have their own data testing and have a good idea as to what this algorithm looks like. When you hire an SEO, you trust their expertise to make the most beneficial decisions to the website with regards to Google’s algorithm and rankings, hopefully increasing your ranks. SEOs do everything in their power to find both new and known ways to increase website rankings for particular keywords. Age and time are a big part of Google’s algorithm. Google always trusts older sites more, so good rankings take time. You will not find one SEO out there that can get serious ranks in one day. Most likely it will be three to four months before we even start seeing good results, maybe up to a year on highly competitive terms. Despite the wait, the benefits far outweigh this long wait, SEO is a long term investment. Think about being #1 for a term, and maintaining that status for years to come. The benefits far outweigh the upfront costs. Okay, So What About Fishing SEO? Let’s talk about what we provide specific to fishing guides and fishing charters. We at 3plains specialize in providing anything the outdoor business needs to have an online presence. People shop online now, so you better impress. Our job is to handle the website building, design, and technicalities while you concentrate on what you do best. Hunting and Fishing Search Engine Optimization is one of the most important and highly demanded services we offer to clients. It simply needs to be part of every businesses marketing budget, or else money is left on the table. Given we specialize in outdoor services; we know a thing or two about fishing ourselves. This industry knowledge and experience in fishing allows us to offer superior SEO services to fishing charters, fishing guides, and outdoorsmen in general. I personally have fished all my life, and know exactly how to carry fishing knowledge over to the fishing SEO industry in ways other SEOs wouldn’t know. After all, you probably wouldn’t want a video game expert writing content and optimizing your fishing business--so keep it in the family! Most all SEO services are cookie-cutter based, and are neither here or there with industry customization and phrases. Ask any other SEO what fish are in season or what fish are limited by state regulations and you will see a deer in the headlights stare. The point is, I know SEO, I know fishing, there’s no better choice out there to help get more people in the door to your fishing business. Though clients always want to hear it, SEO cannot be guaranteed. Ultimately, Google makes the final ranking decision. SEOs can only try their best to persuade Google into liking their site. It is bad practice to guarantee in SEO, so run if you see fishy promises. Many, many people have been burnt by these hit-n-run operations (usually foreign). The reality of the situation is that SEO can be quite pricy, and you pretty much always get what you pay for. If you feel you can find quality SEO for cheap somewhere else, go for it. But don’t say I didn’t warn you. Also, I would not recommend a large SEO firm to optimize your site. With these large firms, the lion's share of your money goes to all the managers and upper-level marketers, and then the fraction that remains is given to the actual person who works on the site. For this reason, your money is much better off at a small consultative firm like ours. Your money doesn't go to our PR budget or a couple people who aren't even involved in the project--it goes right to the labor and services provided! Finding a good SEO is very difficult—even if you were okay with spending thousands. There are so many fakers out there it embarrasses the whole industry. I honestly feel so bad for people who are trying to find a good SEO without any kind of recommendation. More often than not, potential SEO clients are forced to take the word of SEOs because they don’t know any better, and that leaves room for fast-talking scammers online. Whenever possible, try to go with a brand name that is associated and real people who recommend the service. We at 3plains have been doing SEO for years and have many, many returning customers. We can provide any recommendation. Here are some quotes right now, in fact. Looking for internet advertising had not been a fun experience. But, from the first time I called Ryan at 3plains I could tell a difference. Their work has been prompt and professional and I could not be happier with my decision to use 3plains for my business! I have also experienced first hand the quality logo work from "the guys" at 3plains. Thanks! WOW!!!!!!!!!!! MY SITE HAS MADE SOME MASSIVE MOVES HIGHER ON PAGE 1 AS WELL AS GETTING A LOT OF PAGE 2 AND 3 TERMS ONTO THE FIRST PAGE. I CANT BELIEVE THE INQUIRIES I AM GETTING. My website comes up on the 1st page in Google and usually between #1 to #3 for for the search phrase "South Dakota pheasant hunting". On top of that, in the last month alone, I got 4,155 visits from 1,722 UNIQUE keyword searches for an average of over 4 minutes each (industry average is 90 seconds) on the site with 70% of those uniquely new visitors. Your business recommendations, SEO services and realigning my marketing budget has been huge. I get several contacts daily and have booked numerous hunts online since starting service with you guys. My nephew (who works in the tech industry) and I were looking at our website statistics and the different phrases people search for that end up on our site. He was really impressed at how high our website pops up in the search engines. He commented that my computer guys really know what they are doing. Finding a fisherman who is also an online marketing expert and SEO is no easy feat. My main goal in this post was educate you, and secondly to display our genuine skill-set and establish ourselves as an experts in both the fields of fishing and SEO—and that makes us a little different. If you look out on the net, there are SEO prices ranging from a few hundred to 50k+. And this confuses the hell out of people. I understand the confusion. Before I got into SEO I was hiring these "SEO Gurus" myself. Most SEO is an on-going investment, Google changes its algorithms daily. These daily changes mean that it is best to have someone constantly looking over and optimizing the site for maximum exposure. Some SEOs out there offer the "one and done" upfront SEO service. This service is okay, but won't be for long. It is well worth always having an SEO around for an opinion. One of the biggest struggles I have with clients is explaining pricing. Unlike most other services, SEO isn’t very tangible. The many things I do will sound like complete mumbo-jumbo to any person who doesn’t know computer code. If you'd like to hear it anyway, let me know. Most SEOs do whatever is necessary to get good rankings, so it is hard to lay out a general formula. If the site needs X, we get X, if it needs Y, we get Y. Every site is different, so telling customers a static list of services isn't always the best. Pretty much all of the pricing of SEO at 3plains goes into skilled personal labor and analytics tools. Anything I do doesn’t really benefit your business until the rankings start going up. That is the “real” product that you can grasp and is the easiest way to think about it. SEOs create good ranks. Get a quote today or view our pricing plan to see what solutions we can provide. By the time I’m done with my work, you’ll hopefully be a committed client ready to send us your own testimonial!